Ronquillo, J., Denson, T. F., Lickel, B., Lu, Z.-L., Nandy, A., & Maddox, K. B. (2007). The effects of skin tone on race-related amygdala activity: an fMRI investigation. Social cognitive and affective neuroscience, 2(1), 39-44. Todorov, A., & Engell, A. D. (2008). The role of the amygdala in implicit evaluation of emotionally neutral faces. Social cognitive and affective neuroscience, 3(4), 303-12. Ito, T. a, & Urland, G. R. (2005). The influence of processing objectives on the perception of faces: an ERP study of race and gender perception. Cognitive, affective & behavioral neuroscience, 5(1), 21-36. Kanwisher, N., McDermott, J., & Chun, M. M. (1997). The fusiform face area: a module in human extrastriate cortex specialized for face perception. The Journal of neuroscience : the official journal of the Society for Neuroscience, 17(11), 4302-11. Building biases in infancy: the influence of race on face and voice emotion matching. Vogel M1, Monesson A, Scott LS. Dev Sci. 2012 May;15(3):359-72. doi: 10.1111/j.1467-7687.2012.01138.x. Epub 2012 Mar 1. Early in the first year of life infants exhibit equivalent performance distinguishing among people within their own race and within other races. However, with development and experience, their face recognition skills become tuned to groups of people they interact with the most. This developmental tuning is hypothesized to be the origin of adult face processing biases including the other-race bias. In adults the other-race bias has also been associated with impairments in facial emotion processing for other-race faces. The present investigation aimed to show perceptual narrowing for other-race faces during infancy and to determine whether the race of a face influences infants' ability to match emotional sounds with emotional facial expressions. Behavioral (visual-paired comparison; VPC) and electrophysiological (event-related potentials; ERPs) measures were recorded in 5-month-old and 9-month-old infants. Behaviorally, 5-month-olds distinguished faces within their own race and within another race, whereas 9-month-olds only distinguish faces within their own race. ERPs were recorded while an emotion sound (laughing or crying) was presented prior to viewing an image of a static African American or Caucasian face expressing either a happy or a sad emotion. Consistent with behavioral findings, ERPs revealed race-specific perceptual processing of faces and emotion/sound face congruency at 9 months but not 5 months of age. In addition, from 5 to 9 months, the neural networks activated for sound/face congruency were found to shift from an anterior ERP component (Nc) related to attention to posterior ERP components (N290, P400) related to perception. The N400 as an index of racial stereotype accessibility. Soc Cogn Affect Neurosci. 2014 Apr;9(4):544-52. doi: 10.1093/scan/nst018. Epub 2013 Feb 5. Hehman E1, Volpert HI, Simons RF. The current research examined the viability of the N400, an event-related potential (ERP) related to the detection of semantic incongruity, as an index of both stereotype accessibility and interracial prejudice. Participants' EEG was recorded while they completed a sequential priming task, in which negative or positive, stereotypically black (African American) or white (Caucasian American) traits followed the presentation of either a black or white face acting as a prime. ERP examination focused on the N400, but additionally examined N100 and P200 reactivity. Replicating and extending previous N400 stereotype research, results indicated that the N400 can indeed function as an index of stereotype accessibility in an interracial domain, as greater N400 reactivity was elicited by trials in which the face prime was incongruent with the target trait than when primes and traits matched. Furthermore, N400 activity was moderated by participants' self-reported explicit bias. More explicitly biased participants demonstrated greater N400 reactivity to stereotypically white traits following black faces than black traits following black faces. P200 activity was additionally associated with participants' implicit biases, as more implicitly biased participants similarly demonstrated greater P200 reactivity to stereotypically white traits following black faces than black traits following black faces. Ma, Y., Ge, J., Xu, X., Fan, Y., Yang, S., & Han, S. (2009). Asymmetric neurocognitive representation of ethnic in-group/out-group faces. Chinese Science Bulletin, 54(12), 2076-2081. Cunningham, W. a, Johnson, M. K., Raye, C. L., Chris Gatenby, J., Gore, J. C., & Banaji, M. R. (2004). Separable neural components in the processing of black and white faces. Psychological science, 15(12), 806-13. Pauker, K., & Ambady, N. (2009). Multiracial Faces : How Categorization Affects Memory at the Boundaries of Race. 65(1), 69-86. Goh, J. O. S., Leshikar, E. D., Sutton, B. P., Tan, J. C., Sim, S. K. Y., Hebrank, A. C., & Park, D. C. (2010). Culture differences in neural processing of faces and houses in the ventral visual cortex. Social cognitive and affective neuroscience, 5(2-3), 227-35. Do Characteristics of Faces That Convey Trustworthiness and Dominance Underlie Perceptions of Criminality? Seeing race: N170 responses to race and their relation to automatic racial attitudes and controlled processing. Ofan RH1, Rubin N, Amodio DM. We examined the relation between neural activity reflecting early face perception processes and automatic and controlled responses to race. Participants completed a sequential evaluative priming task, in which two-tone images of Black faces, White faces, and cars appeared as primes, followed by target words categorized as pleasant or unpleasant, while encephalography was recorded. Half of these participants were alerted that the task assessed racial prejudice and could reveal their personal bias ("alerted" condition). To assess face perception processes, the N170 component of the ERP was examined. For all participants, stronger automatic pro-White bias was associated with larger N170 amplitudes to Black than White faces. For participants in the alerted condition only, larger N170 amplitudes to Black versus White faces were also associated with less controlled processing on the word categorization task. These findings suggest that preexisting racial attitudes affect early face processing and that situational factors moderate the link between early face processing and behavior. The role of experience during childhood in shaping the other-race effect. de Heering A1, de Liedekerke C, Deboni M, Rossion B.
Dev Sci. 2010 Jan 1;13(1):181-7. doi: 10.1111/j.1467-7687.2009.00876.x. It is well known that adults' face recognition is characterized by an 'other-race effect' (ORE; see Meissner & Brigham, 2001), but few studies have investigated this ORE during the development of the face processing system. Here we examined the role of experience with other-race faces during childhood by testing a group of 6- to 14-year-old Asian children adopted between 2 and 26 months in Caucasian families living in Western Europe, as well as a group of age-matched Caucasian children. 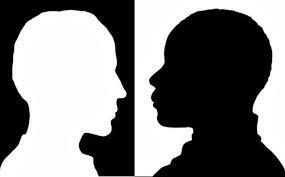 The latter group showed a strong ORE in favour of own-race faces that was stable from 6 to 14 years of age. The adopted participants did not show a significant reversal of the ORE, unlike a recently reported study (Sangrigoli et al., 2005), but rather comparable results with Asian and Caucasian faces. Their pattern of performance was neither influenced by their age of adoption, nor by the amount of experience they accumulated during childhood with other-race faces. These results indicate that the balance of performance with Asian and Caucasian faces can be modulated, but not completely reversed, in children whose exposure to own- and other-race faces changes drastically during the period of maturation of the face recognition system, depending on the length of exposure to the new face race. Overall, experience appears to be crucial during childhood to shape the face recognition system towards the most predominant morphologies of faces present in the environment.